Have you heard the amazing story about the world renowned rabbi who left a sealed message to be opened a year after his death? He said the Messiah had appeared to him and that the message would contain the Messiah's identity. And when the message was opened, it shocked the Orthodox Jewish world, so much so in fact, that they have tried to keep it quiet ever since. 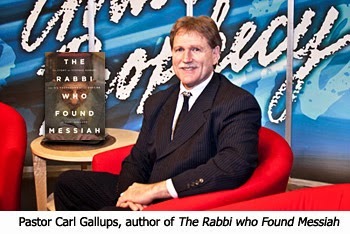 Pastor Carl Gallups reveals what the rabbi's message said and how it has shocked the Orthodox Jewish world in his latest book The Rabbi who Found Messiah. He's also written one of the best apologetics book called The Magic Man in the Sky. Here now is our Christ in Prophecy interview of Pastor Gallups on this fascinating topic. Dr. Reagan: Carl, what do you say to some Christian critics who say, "Why in the world would God appear to a person like Kaduri who is involved in the Kabbalah? Why would God do that? He would never do that." Carl Gallups: No, God would never appear to somebody like... the Apostle Paul. I mean, Rabbi Kaduri, God would never appear to somebody like Simon or a Pharisee or a Priest in the Temple like the book of Acts says. Dr. Reagan: Paul had the blood of martyrs on his hands. Carl Gallups: Oh, Paul was on his way to imprison and/or kill Christians. So would God do this? Absolutely! Has God revealed Himself to some of the most unlikely people? Yes, of course. Dr. Reagan: There are reports all over the world today of God appearing in visions and dreams to Muslims, for example. They say that is the reason they came to the Lord. Carl Gallups: Yes, I've seen those reports. Dr. Reagan: Yet we have people saying, "No, God can only speak through His Word. It is the only way He can speak. God doesn't speak that way directly to people anymore because that was Bible things. God just doesn't do those things today." Carl Gallups: I am just terrified enough of the Lord not to put Him into a box like that. I stay within the confines of His Word. But, within in the confines of God's Word we discover that God can speak out of a burning bush. He can speak from a mountain top. He can speak from a donkey. He can speak from the sky in a vision and say, "I am the Christ." Dr. Reagan: In the Old Testament it says that God never changes, and the New Testament says Jesus is the same yesterday, today, and forever. Carl Gallups: That's it! As long as the message that somebody claims they receive lines up with His Word, and that's the test, we need to look at it carefully. What did Kaduri's message say who the real Messiah is? Jesus. That pretty much lines up with the Word, so I'm going to take a look at it. That's what I've done in this book. Nathan Jones: Why would Kaduri, being an Orthodox Jew and therefore typically be vehemently against Jesus Christ, claim Jesus is the Messiah? Obviously Kaduri's son who took his place right would have his career pretty much trashed. The Jewish community he knew would have a harsh reaction against him. The fall-out for Kaduri personally claiming this would be shattering. Does that mean that Kaduri truly believed that Jesus was the Messiah? Carl Gallups: First of all, Rabbi Kaduri's son David was 80-something years old when his dad died. So, yes, he wanted to carry on the ministry and the legacy of his dad who was super-duper famous. He wanted to carry that on, and I understand that, and I'm not condemning the man for that. I think that's why his son's reaction has been to vehemently oppose his father's claim. Once it was revealed and understood what the note said, it could have collapsed the whole ministry of their family within Orthodox Judaism. Here's the interesting thing asked of Rabbi Kaduri himself. We have people on film in the movie version of my book, and I've them quoted in my book as well, from his Yeshiva who at one time were students of his. We're talking about older gentlemen now. These are not just little 20 year olds. These are older gentlemen who can't even speak English. They were born and raised in Israel, speaking nothing but Hebrew in his Yeshiva while studying to be rabbis. They are on film testifying that Kaduri in his Yeshiva for years before he died spoke of Messiah and said that Messiah was Yehoshua. This is what his own students are saying. Now, if they are lying, then they are, but you have to trust that these guys who were willing to go on camera that are students of his and had been students of his for years would also understand the fallout for claiming that Kaduri said Jesus is the Messiah. 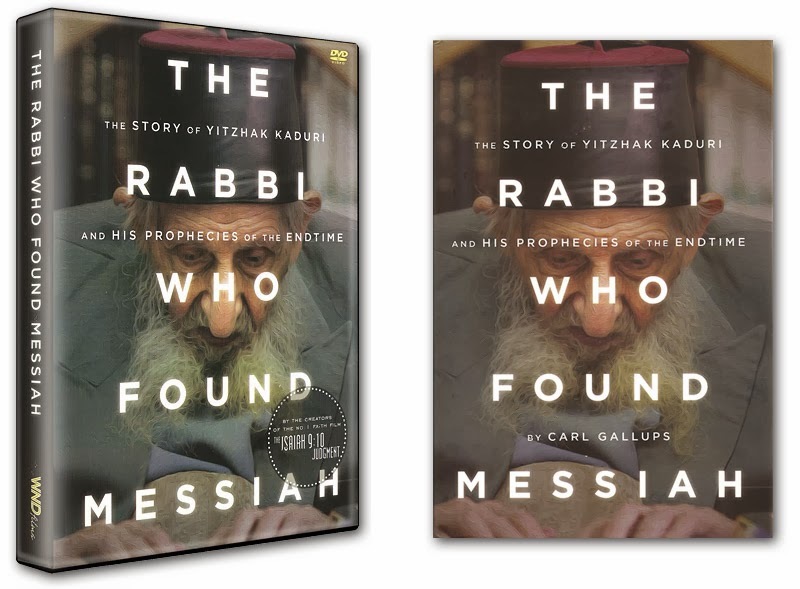 In the fifth and last segment of our interview with Pastor Carl Gallups on the amazing claim of the Messiah is by Rabbi Kaduri, we'll get Carl's final verdict on the authenticity of Kaduri's message. I must admit this sounds like a really great story but I do have some concerns. Has Mr. Gallups address the following quote of the Rabbi concerning how to identify the Messiah? It seem his revelation regarding the Messiah is quite different that what we find in the Bible. Your thoughts on it would be appreciated as well. William, bear in mind that Kaduri was interpreting the Messiah through the lens of Orthodox Judaism. Their view of the Messiah is very different than ours, just ask anyone at the Temple Institute as I did. But, that's because they've never picked up and read a NT to truly know Who the Messiah is. Concerning Christ appearance to Apostle Paul and Simon ...this was the beginning of the establishment of our church today with the written New Testament to form later. Our precious Gospel. This rabbi does not acknowledge the true word of God as written in the Gospel. He acknowledges that Jesus is the Messiah...but as it is written so do demons tremble and know His name. If this rabbi is truly a believer of Jesus the Messiah he would have spoken the truth of the Lord's saving grace to those he loved. He was not a convert as Muslims etc who have visions . This is the spirit of the anti-christ. I have to say I shared your concerns before you posted, just based on the "had a vision" part. After your post of the quote from the Rabbi (taking it as accurate) I have to say I'm even more concerned now. Based on that quote it does not sound like the Rabbi really knew Jesus or believed in Him as Christian do. Even Nathan points out they do not "truly know Who the Messiah is." I wished I had not ordered this DVD and got something else instead. But that is okay (I'm not asking for a refund or exchange). At least the money went to a ministry I trust in and believe in. Correction, the quote was posted by William. We need to be very, very careful when making a judgment about whether or not the Holy Spirit is at work. Jesus told what the "unpardonable sin" was in Matthew 12:31-32 (NIV), "And so I tell you, every sin and blasphemy will be forgiven men, but the blasphemy against the Spirit will not be forgiven. Anyone who speaks a word against the Son of Man will be forgiven, but anyone who speaks against the Holy Spirit will not be forgiven, either in this age or in the age to come." The context would indicate that attributing the work of the Holy Spirit as evil is unpardonable. Let us just then say, "As the Lord wills." Thanks for the comments Nathan. I guess I did not make my concern specific enough. My concern is that if the Rabbi Kaduri receive this revelation from Yeshua, the only begotten of YHWH, why does he say the messiah will come without knowing he is the messiah? Yeshua himself taught us how to identify anti-christs and it is directly related to how they present themselves to the people. Matthew 24:23-27 23 Then if any man shall say unto you, Lo, here is Christ, or there; believe it not. 24 For there shall arise false Christs, and false prophets, and shall shew great signs and wonders; insomuch that, if it were possible, they shall deceive the very elect. 25 Behold, I have told you before. 26 Wherefore if they shall say unto you, Behold, he is in the desert; go not forth: behold, he is in the secret chambers; believe it not. 27 For as the lightning cometh out of the east, and shineth even unto the west; so shall also the coming of the Son of man be. Acts 1:11 11 Which also said, Ye men of Galilee, why stand ye gazing up into heaven? this same Jesus, which is taken up from you into heaven, shall so come in like manner as ye have seen him go into heaven. The question that we must ask of Rabbi Kaduri’s statements concerning the messiah is simple. Did he confess that the messiah who appeared to him was Jesus Christ come in the flesh? Just to be clear...I DID NOT say evil was involved here. I think you are referencing John's comment of "This is the spirit of the anti-christ." My comments are not saying this is or isn't true. The context of my comment was I was disppointed that this Rabbi doesn't not appear to be a Zola Levitt type of individual, which I find very inspiring. It just, based on the quote I read sounded like the Rabbi may have named Jesus but did not know Him as Christians do, as you yourself pointed out, Nathan. So while the Rabbi may have named the Messiah, been led to name the Messiah, I just wonder if He knew the Messiah as we do. Why this big long explaination? Because your comment, Nathan, was very scary in making someone think they may have committed the "unpardonable sin". While not directed at me, as far as I can tell, I wasn't sure who it was directed at until I remembered John's comment (mentioned above). “Jesus told what the "unpardonable sin" was in Matthew 12:31-32 (NIV), "And so I tell you, every sin and blasphemy will be forgiven men, but the blasphemy against the Spirit will not be forgiven. Anyone who speaks a word against the Son of Man will be forgiven, but anyone who speaks against the Holy Spirit will not be forgiven, either in this age or in the age to come." Matthew 12 Verse 31 begins with a preposition dia “therefore” meaning it is the middle of a sentence and the context has to be applied by reading in front of the text. Jesus was speaking of the Pharisees who saw all the Messianic miracles and attributed them to the power of Satan. These religious leaders knew what the prophets said about the coming Messiah, Jesus proved Himself as the awaited Messiah to them with the miracles. These men knew Jesus was the Messiah from His miracles but they chose to reject Jesus and attributed His power to Satan. This was the unforgiveable sin which is impossible to repeat since that time. Then it was by what they saw with their own eyes, but now it is by faith in what is written in Scripture. Holding the threat of this sin over the head of believers since that time is not just a faulty interpretation of Scripture, but is wicked to make believers so fearful of having done it that they fail to grow in their faith and are stunted by it. The old Rabbi failed to specify which Yeshua he meant. Nothing at all about the death and resurrection of Jesus of Nazareth, which means the Rabbi referred to another Jesus. 2Cor 11:4. “Then it was by what they saw with their own eyes, but now it is by faith in what is written in Scripture”. Clarification. Salvation has always been by the grace of God by faith. The Pharisees saw with their physical eyes yet refused to believe. This sin has three characteristics. First, this sin was specifically directed against the Holy Spirit. The second characteristic is that this sin was determined by a special situation, showing the extreme wickedness of the Pharisees who were really the ones who sided with Satan. The special situation was that this sin was committed while Yeshua was present on earth, and while He was offering Himself to Israel as their Messiah. This sin requires the visible, physical presence of the Messiah, offering to Israel the Kingdom of the Jewish prophets. Throughout this passage, there is an emphasis upon this generation. The emphasis is that this generation was uniquely guilty of this sin. And the third characteristic of this sin of blasphemy against the Holy Spirit is that it is eternally damning. There is no forgiveness. It is the unpardonable sin. With these characteristics in mind, what exactly is the nature and content of the unpardonable sin or the blasphemy of the Holy Spirit? First, IT IS NOT AN INDIVIDUAL SIN, but a national sin. It was committed by the Jewish generation of Jesus’ day and cannot be applied to subsequent Jewish generations. Secondly, the content of the unpardonable sin is the national rejection by Israel of the Messiahship of Yeshua while He was present, on the grounds of being demon possessed. There are five key ramifications that should be noted concerning the nature and content of this sin. First, this generation, the generation of Jesus’ day, was guilty of the unpardonable sin. The second ramification is that the sin of the blasphemy of the Holy Spirit was the national rejection by Israel of His Messiahship while He was present, on the grounds of being demon possessed. The third ramification is that it was a national sin committed by the Jewish generation of Yeshua’s day. The fourth ramification is that it was not an individual sin of that day, nor is it a sin anyone can commit today. On this point the Bible is very clear: no matter what sin anyone commits, then or now, every sin is forgivable to that individual who will come to God through the Messiah. But for the nation of that generation, as a nation, it was unpardonable. And the fifth ramification is that it was unforgivable and judgment was set against that generation. Judgment came in A.D. 70 with the destruction of Jerusalem and the Temple and with the world wide dispersion of the Jewish people. There were two results of this unpardonable sin. First, the offer of the Messianic Kingdom was withdrawn. It would not be set up in their day, but will be re offered to a future Jewish generation that will accept it. And secondly, the A.D. 70 judgment was certain and nothing could alter it. Thank you for your replies. It was my understanding...actually stated in previous posts by Nathan if memory serves me right, that it is impossible to commit this sin today. It had to be at that time. That is why, frankly, I was surprised by Nathan's post. By the way, I am NOT attacking L&L or Nathan whom I support, just posting my own comments for discussion.